great alternative for Apple Airpods. mas mura pa. mukhang eto na lang bibilhin ko kesa airpods. iPad Pro at iMac lang yung medyo "bago" sa paningin ko. the rest taon-taon naman meron e.
Apple Ten. Nasaan ang Nine? ^yung 8+ na yung nine. QUOTE: Earlier this week I noticed that an APFS-formatted sparsebundle disk image volume showed ample free space, despite that the underlying disk was completely full. Curious, I copied a video file to the disk image volume to see what would happen. The whole file copied without error! I opened the file, verified that the video played back start to finish, checksummed the file - as far as I could tell, the file was intact and whole on the disk image. When I unmounted and remounted the disk image, however, the video was corrupted. If you've ever lost data, you know the kick-in-the-gut feeling that would have ensued. Thankfully, I was just running some tests and the file that disappeared was just test data. Every installation of High Sierra on Macs with all-flash storage converts the existing file system to APFS, which is optimized for modern storage systems like solid-state drives. However, as Bombich notes, ordinary APFS volumes like SSD startup disks are not affected by the problem described above, so the vast majority of users won't be affected by it - the flaw is most applicable when making backups to network volumes. Bombich says Carbon Copy Cloner will not support AFPS-formatted sparse disk images until Apple resolves the issue. A pair of recent reports have indicated that Apple is currently developing its own over-ear headphones, slated for release as early as the end of this year. As is the case anytime a new Apple product is rumored, everyone quickly speculates as to what it could be called. Thus, it’s time for the same conversation about Apple’s headphones. What do you think they’ll be called? Ming-Chi Kuo of KGI Securities was first to report on Apple’s plans to release its own pair of headphones, with Bloomberg corroborating the report with a few added details. Apple’s over-ear headphones are said to feature noise-cancelling technology and use the same wireless pairing technology as the AirPods. Work on Apple’s headphones has reportedly been “on-and-off over the past year,” with it still being possible for the company to completely scrap the product altogether. The company is said to be facing design issues, already going through several redesigns. Given that Apple itself seems to be unsure of the plans for its headphones, it’s altogether possible that it hasn’t decided on a name. However, a few possibilities immediately jump to mind. AirPhones would be a play on AirPods and headphones, while HeadPods builds off both the HomePod and AirPods. My personal bet is a simple ‘Apple Headphones’ branding, but that’s based purely on speculation. What do you think Apple will name its pair of headphones? Let us know in the poll below and offer up other suggestions in the comments, upvoting your favorites. You can vote in the article here. Headpods? Lol..anyway sana maganda ang quality, although pagdating sa mgabaudio products, medyo nag veer na ako towards Bose because of good experience with them. I'm not really sure where to post this, and I'm not feeling making a new thread. But a nice informative video nonetheless. Noon pa lang pala gusto na ng Apple sa gaming. Hindi lang tinuloy. Mas okay naman na yata sila ngayon na sa iOS ang mga games. Kinakain ang market ng console gaming. Our exploration of the repair ecosystem was inspired by a video sent to us by a trusted source that MacRumors has worked with in the past, who captured footage inside one of the many facilities in China that are dedicated to creating aftermarket iPhone parts. This is a small scale operation where workers appear to be creating an aftermarket touch screen digitizer for the iPhone, a thin plastic component that attaches to the LCD through a flex cable and allows physical touch on the screen to be transformed into digital input, allowing the iPhone's processor to translate your touch into system commands. *SNIP! * Ful article below. VERY informative! I haven't finished reading it myself as it's quite lengthy. Hackity-hack-hack! May na "compromise" kayang pr0nz stash na Apple ID? Time to change passwords then! When you give an app access to your home directory on macOS, even if it’s an app from the Mac App Store, you should think twice about doing it. 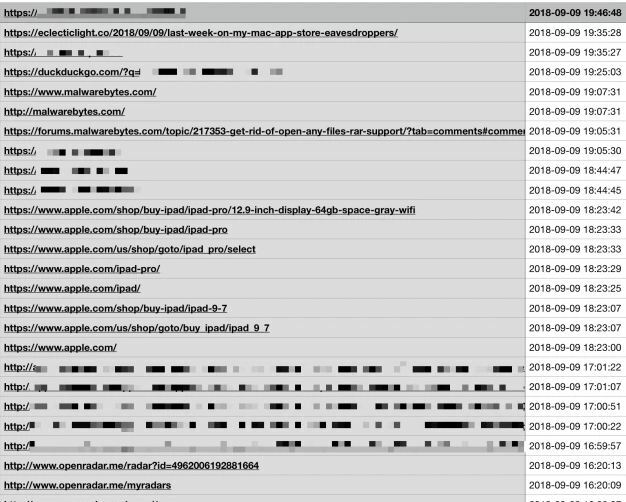 It looks like we’re seeing a trend of Mac App Store apps that convince users to give them access to their home directory with some promise such as virus scanning or cleaning up caches, when the true reason behind it is to gather user data – especially browsing history – and upload it to their analytics servers. Today, we’re talking specifically about the apps distributed by a developer who claims to be “Trend Micro, Inc.”, which include Dr. Unarchiver, Dr. Cleaner and others. This issue was reported before by a user on the Malwarebytes forum, and in another report. 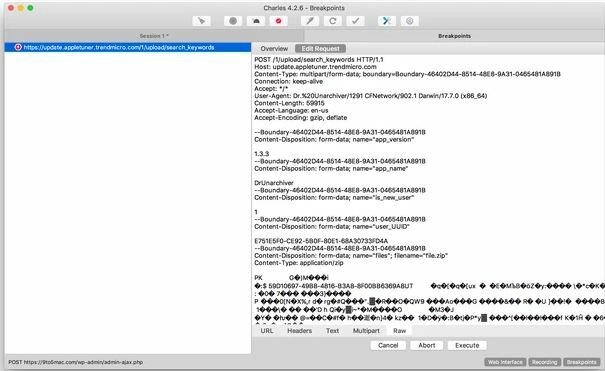 Other researchers followed up and found that apps distributed by this “Trend Micro, Inc.” account on the Mac App Store collect and upload the user’s browser history from Safari, Google Chrome and Firefox to their servers. The app will also collect information about other apps installed on the system. All of this information is collected upon launching the app, which then creates a zip file and uploads it to the developer’s servers. We were able to confirm these reports, at least with the Dr. Unarchiver app. After extracting a zip file with the app, it offered an option to “Quick Clean Junk Files”. Selecting “Scan” launched an open dialog with the home directory selected, this is how the app gets access to a user’s home directory, which it needs in order to collect the history files from browsers. After allowing access to the home directory, the app proceeded to collect the private data and upload it to their servers (we blocked that with a proxy). Scroll down for screenshots. As of today, “Dr. Unarchiver” is the nº 12 most popular free app in the US Mac App Store. This is a massive privacy issue and we expect Apple to pull these apps from the Mac App Store fairly quickly. Users do not expect sandboxed apps to get this level of access to their systems, but it is important to note that when an open file dialog is opened by a sandboxed app, if you use it to open your home directory, the app can potentially get access to lots of private information including browsing history, iMessage conversations, e-mail messages and more. Apple is improving this situation with macOS Mojave, but the App Store review process should have caught these practices and rejected the apps for violating the user’s privacy. The technique adopted by the apps discussed here is very similar to what Adware Doctor did. If you want to protect yourself from these types of issues, never give an app – even from the App Store – access to your home directory, this can happen if the app pops up an open file dialog and you open your home directory with it, or if you drag your home directory into the app. Sana hindi ganun yung CCleaner. Gamit na gamit ko yun sa Windows e. Baka ganun din sa Mac.